The induction motor is classified into a single-phase motor or a three-phase motor according to the using power source. This motor always uses both auxiliary winding and condenser not only when starting but also during operation. It’s starting torque is not so great, but its structure is simple and reliable. In addition, the connection is simple. For a single-phase induction motor, be sure that the condenser indicated in the name plate should comply with the capacity of the motor. For a single-phase induction motor, it is not possible to reverse the direction of rotation within a short time during operation because of the inertia torque exerting adversely against the direction the motor is supposed to change to. Thus, stop the motor first and change the rotational direction. If not, the motor can be damaged. The power source of a single-phase motor includes U(100V 50/60Hz), C(200V 50/60Hz, 220V 50/60Hz, 230V 50Hz). The three-phase induction motor has simpler connection, and higher efficiency and reliability than the single-phase motor, because it can be driven by a three-phase power source directly. 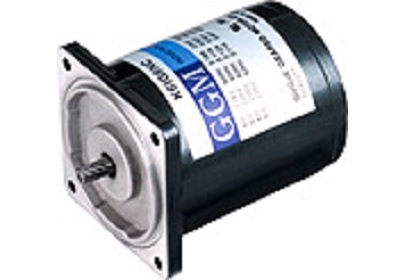 The three-phase motor is popular as a general-purpose motor. The power source for a three-phase motor includes H(220V 60Hz,230V 50/60Hz), M(380V 50/60Hz), Z(440V/460V 50/60Hz). We provide a big range from 6W to 200W induction motors. By using it with the speed controller, a wide range of speed can be controlled (50Hz : 90~1400rpm, 60Hz : 90~1700rpm). The speed can be controlled easily with the speed controller. Depending on the type of speed controller, it can be combined with the motor for various purposes such as speed-control, braking, slow run, slow stop, etc. Built in T.G. (Tacho Generator) to control the feedback. Thus, even if the power frequency is changed but the rotating numbers does not change. When the speed control motor with an electronic brake is used with the speed controller, instantaneous braking and electronic braking operate simultaneously for strong braking power. The speed control motor with an electronic brake also has a non-excitation run type of electronic brake. Even if the power is off, braking is operated to maintain braking of a load. Speed control motors are consisted of the induction motor the reversible motor and the speed control motor with an electronic brake which are small AC motor. The applicable motor should be selected for appropriate uses. Output range of the unit type speed control are from 6W to 180W.